We dodge siege weapons and fight through an army of gargoyles to reach the lair of the ancient blue dragon. The magic swept over us. One moment we were standing within the damp, underground caverns of the storm giant’s home. The next we found ourselves in the middle of the sun-baked deserts of Anauroch, surrounded by a sea of sand. To the north lie a half-buried amphitheater – Iymrith’s lair. We trekked across the hot sands with grim determination. As we neared our destination we could see the ominous sign of the ancient blue dragon – a localized storm cloud brewing overheard. “The storm cloud – it’s Iymrith!” shouted Kazin. The dragon herself descended upon the amphitheater. We responded by consuming the potions gifted to us by the storm giants. Each of us in turn grew three times in size, now looking face-to-face with King Hekaton, who nodded in approval. We braced ourselves for a bout of lightning or a thundering of wings. But the dragon was in no hurry to engage us. Instead she sneered and descended into a giant hole underground. At the same moment, the amphitheater erupted in a swarm of birds. No, not birds, gargoyles. We could see them swarming from hundreds of feet away as we charged. A pair of siege weapons began firing upon us as we ran, our gigantic legs creating a thundering stampede across the desert sands. We’ve officially entered the end game of Storm King’s Thunder. The Maelstrom’s teleportation magic dropped us deep within the deserts of Anauroch, half a mile south of a half-buried amphitheater. King Hekaton, along with two Storm Giants and Felgolos accompanied us as we made the trek to the ancient blue dragon’s lair. When we got within about 1000 feet we all drank our Potions of Giant-Size we had been given from the storm giants. These beauties were incredible for us melee fighters: bumping our STR to 25, doubling our hit points, increasing our move speed to 50, and letting us roll two extra damage dice on all weapon attacks. Sweet Christmas. Unfortunately our first threat wasn’t anywhere near us. As we approached we saw the dark clouds and lightning storm that signified Iymrith’s presence. She descended into a large hole in the amphitheater, forcing us to give chase. As we did, a swarm of gargoyles erupted, circling above the lair. Several took up battle stations near a pair of functioning trebuchets, and for ten rounds we had to endure long-range siege weapons firing at us as we dashed toward them. Thankfully outside of 300 feet they had disadvantage. Every time they attacked the DM rolled a d9, assigning each of us a number. As luck would have it our NPC allies, especially one particular storm giant, would take the brunt of the attacks. Most didn’t hit, but when they did it was a brutal 40+ damage. When we finally reached the amphitheater the gargoyles were upon us – over two dozen! This turned into a slog of a fight. Gargoyles are a bit healthier than we expected, and their numbers guaranteed that a few hits would strike true. We wanted to conserve our spells as much as possible for the final fight. 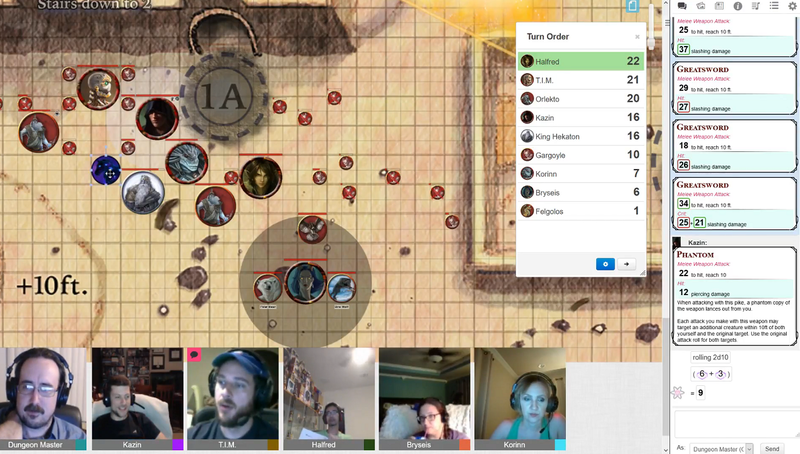 We ended up using Korinn’s powered up Lightning Breath, a Fireball from Bryseis, and a pair of Barrage spells from Halfred to soften them up. In the end it was the Storm Giants who cleaved their way through the majority of the gargoyles, all while the damn trebuchets continued to fire upon us. I initially wanted to duck inside the nearest opening into the amphitheater, but glad I didn’t quite make it. Halfred got close and triggered a pit trap, narrowly avoiding dropping into a wriggling mass of purple, snake-like creatures below. No thank you! We opted to run northeast into the same giant hole that Iymrith had ducked into, again dodging attacks from the trebuchets. Halfred used a Smoke Arrow to disable one of them as we made it inside. The action quieted down a bit as we landed into the sand-filled underground. Halfred could sense a single giant to the northwest (Zephyros? Harshnag?? ), but the only clear path lay directly north. We tentatively explored the next room, finding a large, cascading wall of sand, like a waterfall. A hole in the ground lead to absolute darkness, but we noted tracks going from the hole to the top of the sand-waterfall. Kazin fired some force [eldritch] blasts into the top of the sand, parting it just long enough to see a pair of Yuan-ti guards aiming their longbows. One arrow pierced Kazin’s last mirror image duplicate as we all turned our attention. If this is where the path leads, so be it. 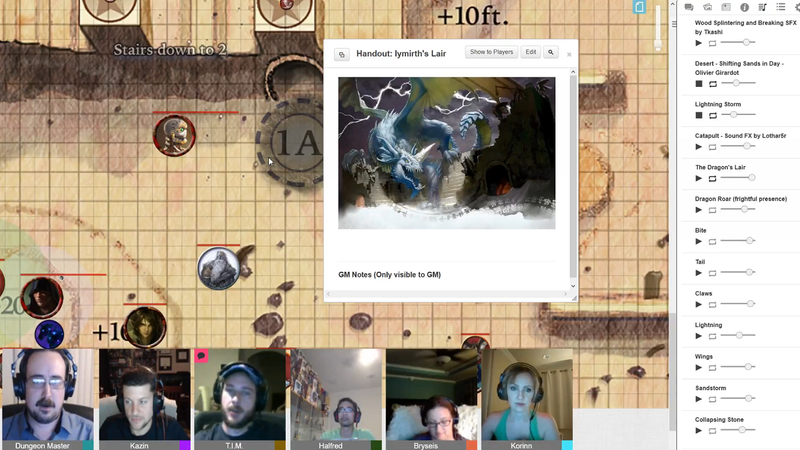 Iymrith will not escape us this time.